Got a power boat, motor yacht or RIB that’s 4 to 13 metres in length? We’ve got great news for you. Now you can jump in your car, call us from your mobile and minutes later get on your boat. Sorted. The Drystack at Trafalgar Wharf guarantees you UNLIMITED, convenient, hassle-free storage and launching of your boat. That’s because we stack your boat in our huge INDOOR 70,000 sq. ft. Aircraft-Hangar-Sized building with FULL TIDAL ACCESS, keeping your boat safe, secure and in tip-top condition. 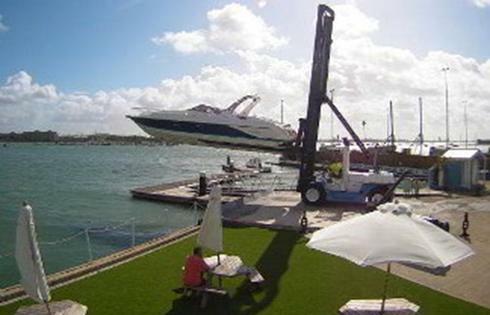 We lift and launch with TWO massive Wiggins Marine boatlifts. This means all you have to do is give us a call and your boat will be at the pontoon ready and waiting when you arrive. No hassle, no problems, NO WASTING TIME. We can store, lift and launch boats up to 13m long and 10 tons (*subject to weight distribution) and that makes us the BIGGEST INDOOR DRYSTACK IN THE UK. The Drystack in Portsmouth makes going out on your RIB or motor boat as convenient and low maintenance as humanly possible. That’s because The Drystack system is the ultimate boat berth for motor boats on the Solent. Imagine arriving at The Drystack at Trafalgar Wharf, parking up (which is free), strolling to the pontoon, and slipping out in less than 5 minutes. Launching is done with great care and precision by our fully-trained and insured staff. You’ll never have to stand up to your midriff on a slippery, windy and wet slipway. And when you come back in, you’ll probably still be in the car park by the time we’ve secured your boat in the undercover drystack. That is only after we have lifted the boat, washed it off, checked it for any damage and stored your boat under cover. The Drystack experience is what discerning boat owners choose because the system really works. For now, it’s still a relatively new concept, but we know it’s going to catch on fast and overtake marina berths for motorboats. Firstly , The Drystack we have at Portchester saves enormously on boat maintenance. Typically you would save £1768.60 on maintenance costs EVERY year for a 10 metre boat. Check out the example here . If there’s a storm in the Solent, it’s 100% guaranteed that there won’t be any damage to your boat. You don’t have anything to worry about (even in the summer when you are away on holiday). Secondly, storage for your boat is very secure. We are on the former Vosper Thorneycroft site and they built boats for the Navy here, so we guard your boat like a top-secret craft. Our site at Portchester is as secure a boat storage as you’ll find anywhere. Plus we have 24 hour security and CCTV and your boat is locked up INDOORS! Thirdly, when you come to sell your boat it will be worth more. Boats in a drystack hold their value because they are in better condition. In fact, this can virtually eliminate any fees associated with The Drystack when you come to sell your boat. A premium of 15-10% is achieved by brokers for boats that have been drystacked. After a great day out, you can travel home safe in the knowledge that EVERYTHING is taken care of by professionals. It’s the ultimate no-hassle way of maximising your precious leisure time. And boat owners that have their boats drystacked find they use their boats a lot more because it’s so easy. Jump in the car, make a phone call, and get in your boat. It’s that simple. D rystack storage doesn’t mean you need to compromise on your boating enjoyment. The Drystack customers enjoy fantastic facilities that include secure free parking, the Waterside Café/Bar, a new shower and toilet block and a comprehensive network of support from the many marine businesses we have on site. Meeting other boat owners who have their boat drystacked is also part of the fun. Because the system takes over any hard work from you, you’ve got more time to socialise and make friends. Big boat storage is no problem at The Drystack at Trafalgar Wharf. We are the only dry stack in the UK able to look after motor yachts, sports boats, powerboats and RIBs of up to 13 metres long and 10 tons. Because of our seven figure investment in the latest dry stack engineering and facilities at Trafalgar Wharf Portsmouth we are also able to accommodate fly bridge motor yachts in our dry stack. Just tell us the height of your boat and we’ll discuss your options. The Drystack is open from 0900 to 1700 all year round with extended opening times to help you make the most of the weather. Just choose to launch and let us know within these hours. If you want to come back or launch outside these times, we can arrange for your boat to be berthed on the holding pontoon until you arrive. The Drystack at Trafalgar Wharf is flexible about your paperwork. You choose either a weekly, monthly, quarterly or annual stay that suits your needs. Contact us for a quote. Remember The Drystack at Trafalgar Wharf experience! Save Time! Spend more time on the water! No worries – park the car, jump in the boat and you’re off! To Reserve Your Place or Get a Quote For Undercover Boat Storage In Portsmouth or call us on 023 9270 6384.